While i am not a full on #nevertrump person, I am as close to that as possible. The only reason I can see myself voting for Donald Trump in the general is the hope that he will appoint a conservative supreme court justice, but since Trump has no idea what it means to be a conservative, I doubt he would be able to identify a strict constructionist jurist to nominate to SCOTUS. Having said this, it has been quite discouraging to watch as the conservative media engage in a civil war over the Donald. As a person who thinks Donald Trump is not only unqualified to be POTUS, but he is unfit for the office, I cannot understand why people like Anne Coulter have openly supported Donald Trump. But at least she is not hiding her support. Its people like Sean Hannity and Laura Ingraham that seem to be in the tank for Trump while feigning neutrality. I turned on Laura once in the past 4 months (after at one time listening to her every morning for at least 30 minutes before getting to work) and she was actually critical of Donald Trump, so I may have to reconsider my feelings toward her. Sean Hannity, on the other hand, might as well just come out and support Trump, since he seems to be a full throated mouthpiece for the Trump campaign. Sean has said that he offers equal time all of the candidates, and while time wise that is true, as Red State points out equal time does not equate to equal treatment. While Sean asks the other Republican good hard questions, Trump gets almost exclusively slow pitch softball questions that a 10 year old could answer (of course Trump is about 10 years old in much of his thinking, so maybe that is all he can handle). But its not just the softball questions that Sean asks; its his unabashed defense of Trump. This past week Sean has been ranting about what happened in Colorado trumpeting Trump's assertions that he was somehow cheated out of delegates in the Rocky Mountain State when how Colorado had (stupidly) decided to hand out their delegates was known LAST AUGUST. What really happened is that Trump got out-maneuvered by Ted Cruz and his superior ground game. The Donald lost because he had not hired the best people and is not running the greatest campaign ever. I'm also disturbed by how Sean has overlooked a myriad of statements and actions by Trump (not just this year) that illustrate a lack of idealogical conviction, a lack of depth, and ultimately a person who is just not a true conservative. Just because he wants to build a wall, and "make a America Great Again" doesn't mean that he is a conservative. Pat Gray of the Glenn Beck program posted this on facebook as commentary to the above cited Red State article. "And when you claim on-air that "you can't think of a SINGLE issue where Trump's not conservative"...that one had to make even Trump himself, grimace. By the way, let me help you with that: Universal Healthcare. How about this? Eminent Domain. Not conservative. Let's not forget: Trade Tariffs. Not conservative. Funding Progressive Democrats so they can be re-elected? Super-mega-doppler, NOT conservative. Even WANTING Hillary at your wedding? Not conservative. On Abortion: "The law has to stay. Keep the law." On the other hand. When President: He'd "change the law." Not conservative. He supported, and as far as I can tell, is still fine with the Bailouts and TARP. He's had plenty of bailouts in his business life, so, why not? Well, because it's...not conservative. Attacking Megyn Kelly?!?!?! That's not even human, let alone conservative"
While i am not a huge Glenn Beck fan but Pat is spot on. Trump is not a Conservative and Hannity is letting his support for the guy cloud his judgement. I had not been a regular listener or watcher of Hannity for a while, but he has lost all credibility with me now, and I'm done with him for good. Losing Faith in Conservative Media, Especially Drudge. This election has divided not just the Republican party but the conservative movement. I listen to a lot of talk radio (when I can). I for at least a few minutes most days listen to Rush, Glenn Beck, Hugh Hewitt, Laura Ingraham, Sean Hannity, and Michael Medved. Let me preface the rest of my comments by saying, Rush has always been one of my favorites and while that has waned some in the last couple years I still listen to him regularly and have always really liked his show. Lately I have listened to some Glenn Beck, but can only stomach about 20 minutes of him at a time. I used to listen to Laura Ingraham a lot in the mornings, but she seemed to become a one issue host (immigration) and I do not listen to her much anymore. I must confess that my two favorites are Hugh Hewitt and Michael Medved each for their own reasons. I am sad that Hugh has gone to East Coast mornings as I am not awake that early. I love Hugh for all of the pundits from both sides of the political isle that he has on his show and for his commentary. He sometimes is a bit too establishment for me in his thinking, but he is still a good conservative. I love Michael because he welcomes debate and uses the facts to just destroy left wingers that call up to his show. As for news, I also frequently went to the Drudge Report as I felt it was a good conservative news aggregator. Having said all of this, it is becoming extremely difficult to listen to any of these people anymore. To me it sounds like Sean and Laura are in the tank for Trump. At least Sean tries to say he is fair, but it is clear that he loves the Donald and wants him to win the nomination. Laura is almost that bad. What has really upset me is that The Drudge Report is fully in the tank for Donald Trump. Drudge, who I used to go to regularly has gone off the rails. The latest is the headline today that announced that Colorado cancelled their state Republican caucus. While this is true, it is old news. They decided this last summer before Donald Trump even announced he was running but Drudge is shouting it this just happened. Look at the image. It is of a voter probably from one of the past votes in Iraq when they dipped their fingers in purple ink to signify they had voted. Couple the image with the misleading headline and you get propaganda that Hilter himself would be proud of. There may be some fury among Trump supporters, but this is what the Colorado Republican party did almost a full year ago. Trump should be more mad at himself for not having a better organization than Ted Cruz and getting out maneuvered in Colorado (which is what happened). 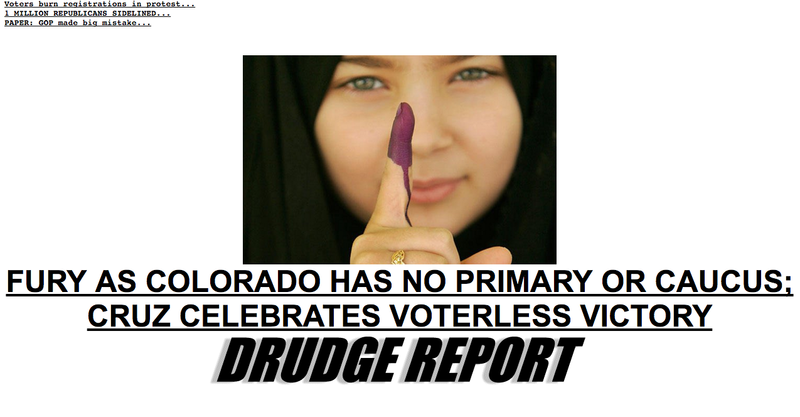 Drudge has lost all sense of objectivity. He finds every story he can to smear Cruz and even if it is not a good smear the Drudge headlines are worded in such a way to make them seem worse than they really are. It is just disgusting. Drudge is the Roger Stone of the conservative news world. One would think that a conservative news sight would try to stay a bit neutral but it what Drudge is now doing has caused it in my mind to lose ALL CREDIBILITY. I have stopped reading Drudge with any regularity and am saddened by what I used to think was a great news aggregate.